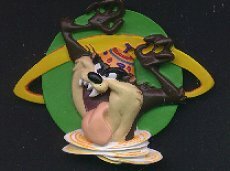 "Tasmanian Devil Magnet - Warner Bros.
(917) Tasmanian Devil Magnet - Warner Bros -Condition: Excellent Painted on Bisque with a magnet attached at the back. The Tasmanian Devil measures 3" by 2 1/2". Price: $4.00 + shipping.